An artist has drawn up concepts for a Fortnite and Pokemon crossover. 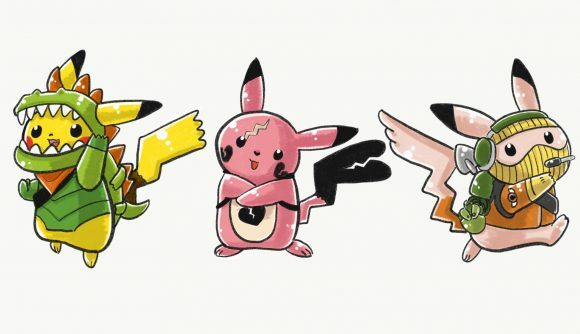 Specifically, the drawings focus on the most famous of all the Pokemon – no, not Snorlax, but his day will come – Pikachu, and how the little yellow rat would fit into the various skins available in Epic’s battle royale phenomenon. You could call this the ultimate crossover for an entire generation – it probably is. There are a number of drawings that show how Pikachu could fit into the Fortnite skins, which so far include: Rex, Cuddle Team Leader, Raptor, Ragnarok, Plague, Whiteout, Wildcard, and Tricera Ops. There may be more to come yet, too. The illustrator runs a YouTube channel called Colorful Sketch, which is where you can see all of the Pikachu Fortnite costumes, delivered as step-by-step drawing tutorials. Where these wonderful concepts came to our attention, however, is over on Reddit, where the artist shared the drawing above – showing off the Rex, Cuddle Team Leader, and Raptor drawings. Perhaps this crossover isn’t as weird as it seems at first. Certainly, both Pikachu and Fortnite and very popular these days. And considering we now live in a world that has a live-action film starring Ryan Reynolds as the voice of Detective Pikachu, well… this Fortnite Pikachu crossover is downright charming in comparison. Have a watch of the video above to see how the illustrator put together the Whiteout x Pikachu skin, and if you want, have a go at it yourself. You’ve got to love the details put into changing every part of Pikachu for the skin – including fur colour, tail, and ears.